Number one ambassador on the ice, prolific scorer, team leader, gentleman, and all around good guy were accolades attributed to Galen Head when his # 8 sweater was retired and he was inducted into the Johnstown Hockey Hall of Fame and the Cambria County Sports Hall of Fame in 2003. Galen’s hockey journey started in a War Memorial Arena in Grande Prairie where his Dad was Rink Manager and ended in a War Memorial Arena in Johnstown Pennsylvania; a town that adopted him as one of their own. As a kid who spent a lot of time in the rink with his Dad he had two dreams: to be a rink rat and a Zamboni driver. He realized his dream to become a rink rat but by the time he was old enough to drive a Zamboni he was too busy playing hockey and carving up the ice. Like other hockey prospects in Grande Prairie he learned cooperative and competitive hockey skills on the outdoor rinks along the banks of Bear Creek. In his words, “It was awful cold but they were the best days of my life.” He moved quickly through the minor ranks and at age sixteen he was recruited by the senior Athletics. 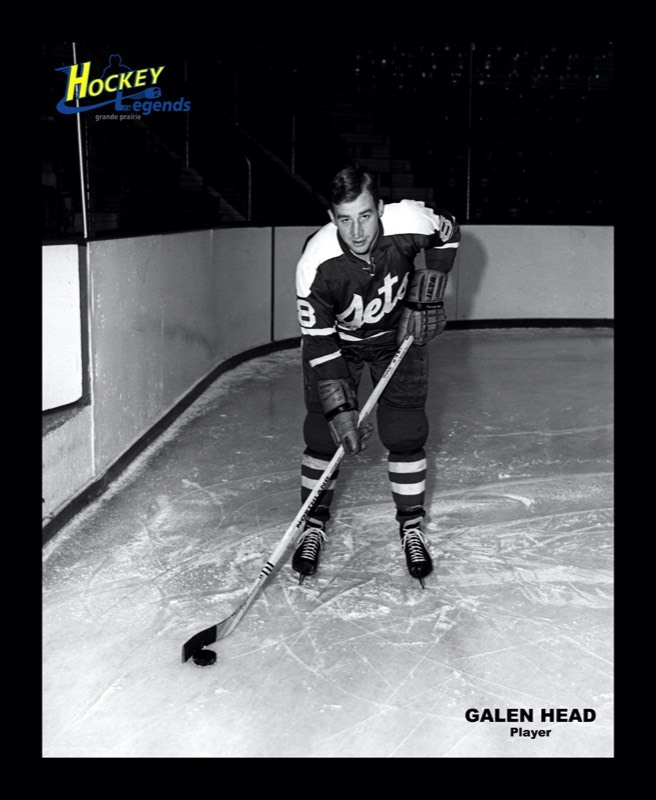 At the end of the 1964 South Peace hockey League (SPHL) season the Tribune reported that “Galen Head youngest player in the SPHL at age 16 copped rookie of the year honors collecting 17 goals and 11 assists for 4th place in team scoring.” The following year Galen was invited to try out for the Edmonton Oil Kings and the Tribune reported “If Galen makes the grade with the Kings it should be some kind of gratification for city buffs. This city kid and another local Athletic, Stan Neufeld started at the very bottom of the minor hockey system. After all this is the purpose isn’t it?” Galen made the cut and as an Edmonton Oil King. He scored 50 goals in 56 games; 18% of the team’s goals that year and they won the Memorial Cup playing against the Oshawa Generals led by Bobby Orr. “I remember Galen as a very good skater who had a very good knack for scoring goals and was a major contributor to our success during those years.” (Ross Perkins – teammate). In 1967 a cheque stub shows that he was paid $130.00 for an unsuccessful one-game tryout with Detroit and he returned home. He played one game with the Red Wings against Toronto in 1969 following a brilliant year with the Johnstown Jets when he scored 67 goals in 72 games. In the same season he played six games with the Ft. Worth Wings in the Detroit system. A cheque stub indicates that the Fort Worth Wings Inc. paid him $100.00 per game for a total of $600.00 for his services. Compare that to salaries collected by professional hockey players today. A serious injury while playing with the Salt Lake Golden Eagles the following year likely thwarted an NHL career. An interesting footnote to the Galen Head story is that as a Johnstown Jet he was Captain of the team that inspired the film, Slap Shot. His teammates were the infamous Hanson brothers. Galen’s wife Gracie played the role of Pam in the movie – Galen was one of the uncredited players. Upon retirement Galen coached high school hockey in Johnstown winning three State championships in eleven years and served the Johnstown Chiefs Hockey Team as a volunteer Assistant Coach. Galen and his wife Gracie established the Galen Head Jr. Memorial Scholarship Fund in honor of their eldest son who died in an automobile accident. The fund provides college scholarships for local hockey players.